I should have you know that the title of this game alone — Emu Ranchers — puts a nerdy grin on my face, but that pales in comparison to the terrific fun I had while playing this light, yet highly strategic two-player card game. The first sign that this was going to be a regular go-to game at our table was that my wife absolutely loved it. As our first game concluded (she lost terribly with negative points), she said that magic phrase all gamers want to hear, “let’s play again.” So we began anew with rows of emu. Yes, rows of emu. 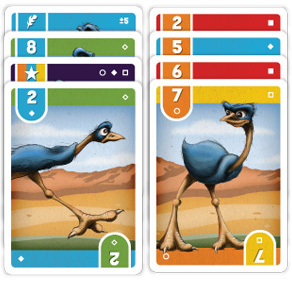 Your hand of six beautifully illustrated emu cards will mostly contain cards numbered 2-9 in different colors and possibly a few special cards. The object of the game is to lay these into as many profitable rows (or “pens”) as you can. You can create as few or as many rows as you want. As long as the numbers you’re placing are increasingly higher or descending lower, and you are matching the established color of the row (more on that in a bit), you are ranching emus like a seasoned pro. 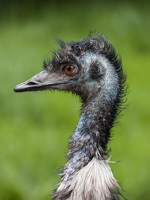 The more emus you add to a pen, the greater the total will be when you add their values up, and the greater the likelihood that you’ll be making fistfuls of money off these creatures that sport an inflatable neck sac that can be used to make loud booming, drumming, and grunting sounds. A good portion of the strategic goodness of Emu Ranchers derives from the duality of colors on each card. For instance, the number “8” emu card can be placed as green or flipped upside down to be blue. Since you must match the established color in each row, you may often find yourself trying to decide between using your “8” (or whatever number) as a green card in one row or as blue in another. There are six colors total. The other cards in the mix include Wilds (an advanced element which can be used as any color and number), Feathers, Eggs and a single Buyout card (another advanced element). Without getting into the nuts and bolts of the entire scoring system, feathers have a value of “10” and eggs have a value of “1.” As such, you may begin and end rows with them as if they were numbered. Having either of these special cards in your rows at the end of the game can mean extra positive or negative points to your total. Herein lies another important strategic element to the game. Adding eggs and feathers in your rows is the best way to rack up points, as each is worth an extra 5 points if your row is ultimately profitable! (Your numerical total should meet or exceed 18 points.) On the other hand, where there is great reward, there is risk. If you row is short, lacking or otherwise numerically insufficient, you’ll be docked 5 points for being a terrible emu rancher. Perhaps you were unable to provide your emus with enough pebbles and stones to assist in their digestion. 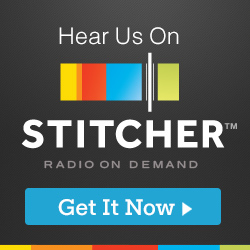 Come on, an emu rancher should know this stuff! Also, if you happen to be using the Buyout card, you can just say “to hell” with one of your lackluster rows and eliminate it from the final tally. I can attest that that’s a fun card to add to the mix. Emu Ranchers is on Kickstarter at the time of this writing, and I highly recommend that you stand tall (I’m talking up to 6 1/2 feet tall, emu style) and support it. 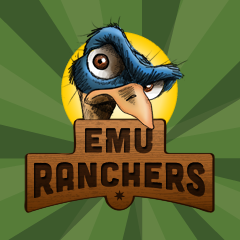 Your inner emu rancher will thank you and so will your future competition.